It can be used for all sorts of things, Chocolate, Ceramic, silicone, solder paste, food etc. And a build video is here - if you want to build one. Amazing, well designed paste extruder. Fantastic! Great stuff, nice concept to use the belt. Do you reverse the motor at the end of a run? Presumably the belt doesn't allow you to reverse the syringe, just release the pressure. Is that sufficient to stop the flow? Thanks, yes, just releasing the pressure by stopping seems to work. I'm printing quite slow, using no reverse and with a moderate travel speed (~100mm/sec) I'm not seeing any significant ooze, just a little when using the needles, less when using just the syringe without a needle. I didn't expect to be able to print the frog in Porcelain, but it worked quite well at slow print speeds (12mm/sec). It could be more problematic at higher printing speeds, a little reverse may also help then. I'm trying finer needles at the moment, then I'll try speeding it all up and see what happens. Wow, richrap, that's cool! Congratulations. I've been wondering what was happening with the intriguing [email protected] (paste extruding) style printers which sort of seem to have disappeared. 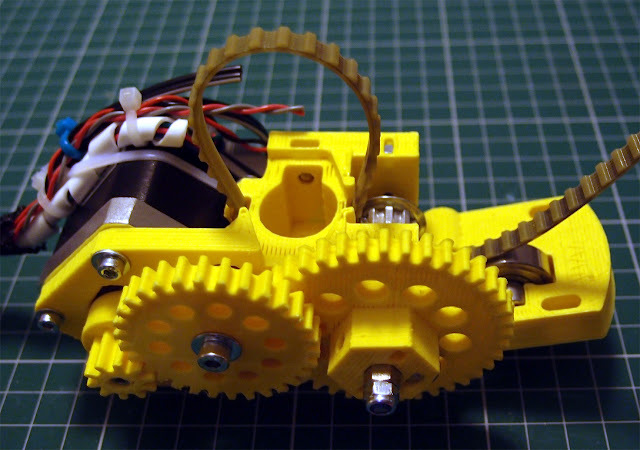 But now, thanks to your innovation it seems that we can have it all with our Reprap style printers! I enjoyed watching your videos as well -so did my 3 year old who is now demanding that we print chocolate bunnies with our Mendel! Has anyone experimented with acrylic paints? Does anyone know if there is a variant on this that fits nicely to the RepRap Mendel X carriage. I guess making an adaptor would not be too difficult, but I'd like to save myself a bit of time. So, I've started an exercise to create a paste extruder body which is an easy fit to a Mendel RepRap pro X carriage. I've used google sketchup to add a flange to the side with 4 x 3mm holes that align with the Mendel's X carriage mounting holes. I will post this STL on Thingiverse when I'm happy with it. As this is my first run through the entire toolchain, drawing package -> slicer -> print this is taking a while. I started off with slic3r, (latest version) and I was able to create all the gears but my modified body is quite strange. Viewing the slic3r g-code the flange which is about 4mm thick comes up to about layer 38 (.4mm layers). Using SFACT I can get a printable part with a flange of the correct thickness but it does throw error messages about incomplete triangles up to about layer 38. The various layers look ok and this is very odd as the rest of the body is unchanged and the flange should be 4mm thick. I tried using the freeware version of netfab to fix the stl, which it did, but resulting, repaired STL file is tiny compared to my original model file?!?! I tried using cadspan the 'skin' the file but although it seems to be processed correctly I'm still getting warnings about incomplete triangles when SFACT runs. Also, when the part is printed the holes in the flange come out smaller than in the model file, intended to be 3mm diam, comes out about 1mm. Any ideas about how best to fix the part?